Fashion photography, much like most wine writing, can focus too much on the facts for my taste – shoes, hats, dress, size, price, perfunctory smile and twirl – and then, there is the photography that makes everything “rich and strange“. 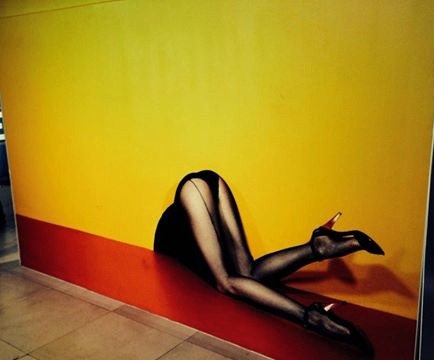 This is the photographer, Guy Bourdin: his exhibition is currently on at Somerset House in London. His posters stare back at me every night on the tube on the way home from work. The effect of his photography on the senses during peak hour is like seeing an elaborate window display of pastries when on a sugar-low. Although Ponce (pronounced Pon-the) is the winemaker on everyone’s lips at the moment, from his cool spot in Manchuela in Spain, I was blissfully unaware of the wine facts when I tasted Reto. It is big, wintry white wine that some may dismiss as easily as puff shoulders and flouncy gowns. It is big but this Albilla (the grape variety) is certainly more precise than a Chardonnay from the 1980s. Not everyone wants lean and mean and I believe there is a secret group of people who want a bit of richness, a bit of strangeness, a bit of drama. 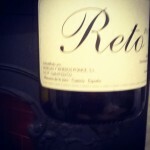 Reto, means “challenge” in Spanish, and this certainly puts up a good argument against certain French wines found on restaurant wine lists at the same price (about £30). If you can find this wine (it’s a small production, but it certainly is in restaurants in London, and I hear, in Australia) and you are thoroughly tired of white wines made by scientists filtered through the spin of copywriters, then this is for you.